The Hotel du Vin / Malmaison Group and The Scotch Malt Whisky Society are announcing an exciting new collaboration to provide Society members and non-members the opportunity to sample and enjoy some of the world’s rarest malt whiskies in the superb environment of Hotel du Vin and Malmaison hotels. Until now members have been able to enjoy the Society’s single cask, single malt whiskies in its three members-only venues throughout the UK; two in Edinburgh and one in London. 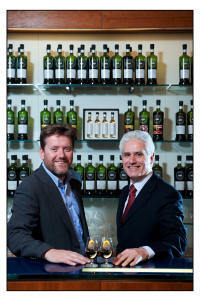 This unique partnership will now enable the Society’s 26,000 worldwide members to enjoy its limited edition bottlings, Society members’ events and luxurious ‘Society Suite’ hotel rooms in three new properties as from the end of January 2010. Aberdeen’s Malmaison, Birmingham’s Hotel du Vin and Brighton’s Hotel du Vin will all open their doors later this month with a special Society snug – the ‘Whisky Snuggle’; dedicated lounges and bar areas where Society members and hotel guests can discover a range of different Society bottlings in unique and inspiring atmospheres. Commenting on the partnership, Robert B.Cook, Chief Executive Officer, Hotel du Vin and Malmaison, says: “We are always looking at ways in which to innovate and bring something very special and unique to our customers. The Hotel du Vin and Malmaison Group together with The Scotch Malt Whisky Society share the same passion for excellence and I believe it is a natural business fit for us. We are confident that this collaboration will be a success.